What's your greatest asset? Life insurance forms a critical part of the financial planning process, providing financial security for you and your family. A sound financial plan will encompass both wealth creation and wealth protection. Life insurance shifts the financial burden from you to the insurance provider who can afford to protect you because of the pooled premiums paid by their customers. Put simply, life insurance is there to provide you with protection against the financial impact of an event such as death, disablement, serious illness or injury. What type of insurance is available? In the event that you are unable to work due to illness or injury, income protection provides you with a monthly benefit. This is paid for an agreed period of time while you are unable to return to the workforce. The premiums that you will pay for this type of policy are generally tax deductible. If you hold your insurance within super, the super fund is able to claim a tax deduction on income protection insurance premiums which can reduce the cost of the cover. Life insurance helps alleviate the financial burden your family may be left with after your death. Usually paid as a lump sum, your dependants may use this money to assist with medical costs, funeral expenses or help secure their financial future. The cost depends on the amount of cover (age, gender and smoking status are also determining factors) you choose. The level of cover you have should be reviewed regularly to ensure it remains suitable. 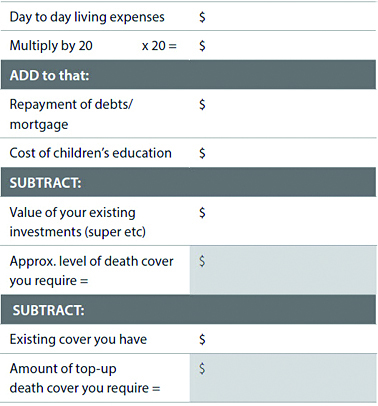 Should you get your life insurance within your superannuation fund? Many superannuation funds will provide you with the option of purchasing insurance through the fund. You can potentially benefit from tax deductions and cheaper costs when you hold insurance within a superannuation fund. There is, however, often a wider choice of insurance cover available outside of your superannuation fund. It's important to understand your cover as it may help you avoid any complications if you or your estate need to make a claim. You should read and understand the product disclosure statement along with the entire policy document. If there's something you are unsure about, ask your financial adviser to clarify it for you. How much cover do you need and what type? Your financial adviser can help you select the most appropriate life insurance option and provider, and can review your insurance cover regularly to make sure it remains appropriate to your ongoing needs. This table is for illustrative purposes only. You should seek advice from a financial adviser to ascertain your specific insurance needs. This illustration does not take into account inflation or indexation on earnings.